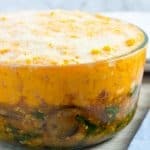 A healthier version of shepherd's pie with a unique flavor profile. Place sweet potatoes in pot on top of trivet. Then add 1 1/2 cups of water and lock lid. Cook for 20 minutes at high pressure. Once cook time is complete, allow pressure to release naturally (about 15 minutes), then quick-release remaining pressure. Carefully remove skin and any dark spots from sweet potatoes and transfer them to a large bowl, along with butter, brown sugar, and 1/2 teaspoon of salt. Mix well, then mash them until their like mashed potatoes. Rinse out pot and dry completely. Using sauté setting - add 1 tablespoon olive oil and mushrooms. DO NOT add any salt at this point (something you'll rarely hear me say, since you should season as you go). We want to brown the mushrooms and if we add salt now they will sweat. Cook them for a few minutes on each side, until the begin to caramelize. Once they have browned, hit them with a dash of salt and remove right away. Set aside. Add 1 tablespoon olive oil to pot, along with onions and 1/2 teaspoon of salt. Cook for about 4-5 minutes, stirring frequently, until onions are soft and translucent. Remove and set aside. Add 1 tablespoon olive oil and turkey to pot and break up as much as possible. Then leave it be for a few minutes to begin the browning process. Stir occasionally. Once turkey is fully broken up and nearly fully cooked, add 1 teaspoon salt, garlic, turmeric, cumin, chipotle powder, and smoked paprika. Mix well. Return mushrooms and onions to pot and mix well, along with tomato sauce. Add spinach and mix until spinach is wilted. Transfer turkey mixture to a (1.75 qt) pyrex dish. Press down into an even layer. Then add sweet potatoes on top of turkey and spread in an even layer. Top sweet potatoes with parmesan cheese. Add a 3-inch trivet to pot, along with 1 1/2 cups of water. Place bowl on top of trivet and lock lid. Cook at high pressure for 5 minutes. Once cook time is complete, quick-release pressure. Then carefully remove bowl to serve.